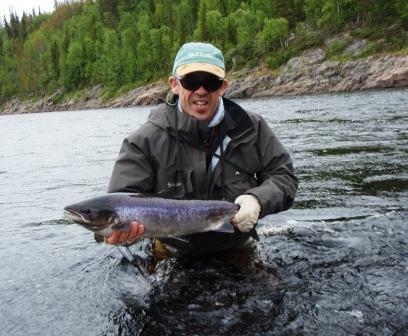 One of regular guests, Ian S, is both an excellent fisher and a canny designer of flies. Last year he introduced the Percy Special to Varzuga with great success. This year his new fly is called The Champagne Shrimp. In my view it is just a variant of the Percy Special, in his view a masterful new creation crafted after hours of deep thought. Well, whatever the creativity behind it, it works – very well – and rare copies of the Champagne Shrimp are much in demand at the moment. 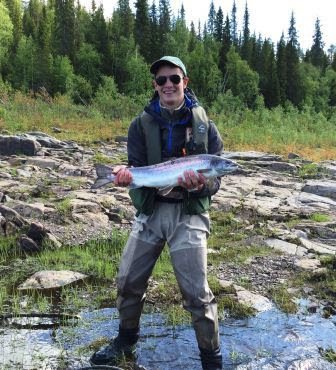 Unusually Ian did not top the leader boarder yesterday, Gregoire was top rod with seven salmon, and our total for the day of 48 was pretty evenly spread amongst the team. A much better days fishing overall, the wind was down for once and it felt much more settled and calm. ﻿﻿Sadly that cannot be said of this morning – we have a strong upstream wind again and there was quite careful consideration of the beat map at breakfast as we tried to work out where the most sheltered pools would be. Ian and Chris had both caught salmon before tucking into their scrambled eggs which at least gave us hope that even in the wind we should have another pretty good day. 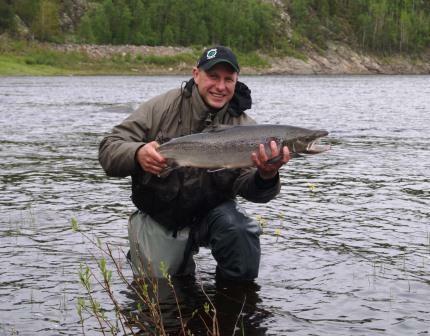 Richard G and his team over at Kitza yesterday had 26 salmon, and up at Pana they landed 41. 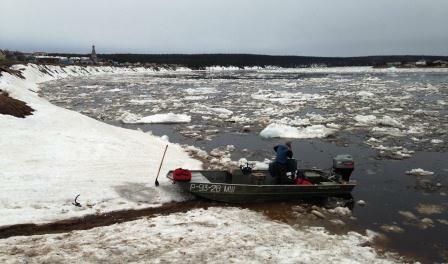 The water height is still steady, no sign of it dropping – yet. 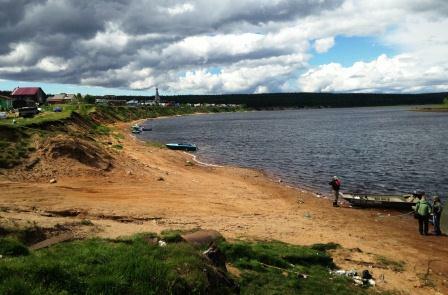 And with little sun this week the water temperature remains at 11⁰C. A very steady river just now and I think that accounted for our improvement in numbers landed yesterday. 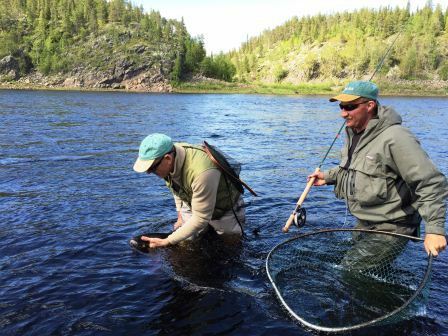 This week seems to have flown by, tomorrow we depart for Murmansk and in the evening there will be the Saturday evening rush to get into waders and down to the river. The cooks know the form; you do not plan soufflé on first night. When we approach the midweek point there will be a flurry of calls to the office in Hungerford from the coming week’s guests all asking Lynsey what the conditions will be for the coming week. To save Lynsey giving you the correct, predicable answer – "bring layered clothing" - here is an update. Predictions on conditions up here are notoriously difficult – we once had snow on midsummer’s day. At the moment the weather looks settled and with late June fast approaching it ought to be warmer. With the warmer weather will come the mosquitoes, and with so much standing water this year it could be a vintage mosquito season. So if you are coming next week please bring mosquito defences – certainly you should bring a spray and if you don’t like them a net is helpful. The water level is going to be higher for this time of year than normal. At Pana and Kitza it is about at the perfect height just now and all the beats on both rivers are accessible. That could change quite quickly, it really is impossible to tell how quickly the water height will drop – a week of warm wind and sun could change things fast. At the moment at Middle Camp, as I have mentioned a few times before, we could do with lower water. 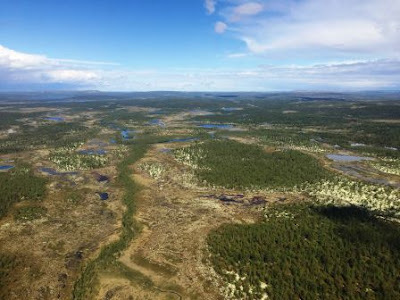 Good examples for those of you who know Middle would be Robinson’s Folly and Bomber Ally where fishing from the gravel bar in mid river is still tricky/impossible unless you want a bit of a swim to the White Sea. 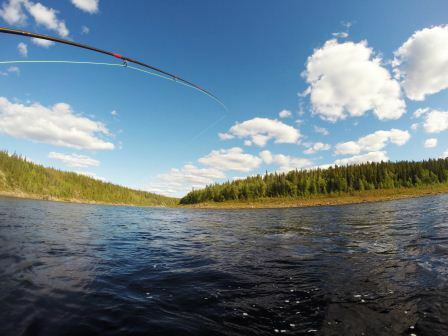 We have not done much surface fishing – the best method at the moment is a slow sink tip, or an intermediate tip, a fairly short leader and a #6 or #8 double hook fly. Personally I would use a floating line and a ½" brass tube – but that is just me – the 12 rods here do not agree (and they are catching salmon)! In any event bring an intermediate tip. 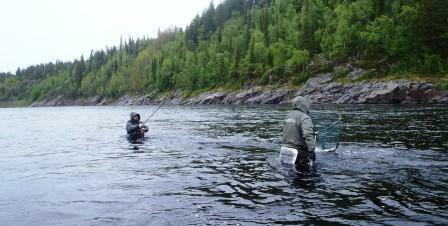 Onto yesterday’s results – up at Pana they put 42 salmon in the book. 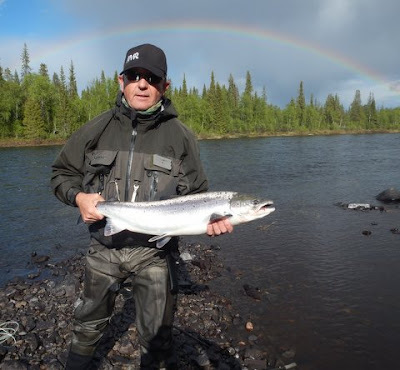 David M had another really good fish, 17lbs from Ford (they had 52 on 16 June which I was unable to report as the Corn Flour order was deemed more important!). 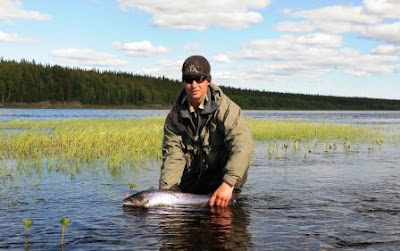 Over at Kitza they landed 32 salmon to eight rods with Josh leading the board with 10. 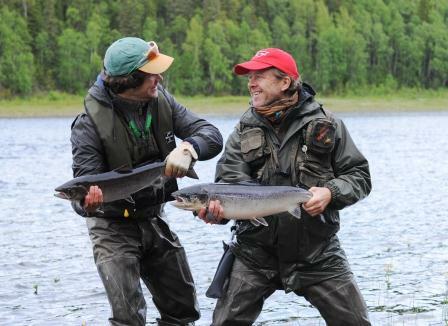 Here at Middle Camp we recorded 36 – very consistent – with Ian again top rod with eight. We look forward to seeing our new guests next week – in the meantime - hat, gloves, an anti-mosquito spray, layered clothing and an intermediate tip! 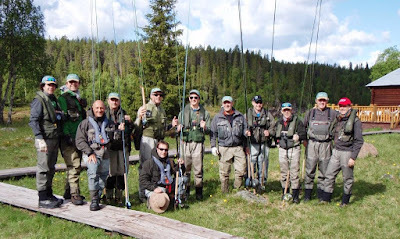 There is more to a fishing trip than just the fish. 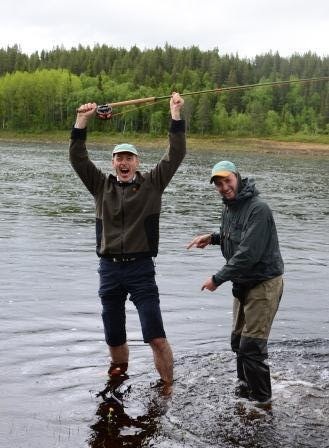 Yes, I know, landing a few salmon is what brings you to this remote, wonderful wilderness - but it is also about family and friends and just simple fun and happy times. This week we have long standing teams in all the camps. Up at Pana Charlie T has taken on his father’s mantle and the team, in various guises and with a few changes over the years has been with us since 1991. Likewise here at Middle Camp G de S and Rodolphe C and family have been here since 2003. Over at Kitza too Richard G and the team have many, many years under their belt. Yesterday morning was pretty grim; cold, windy, grey and damp. Terry decided that lunch should be back at the Lodge and we all dried out by the fire for an hour or so. 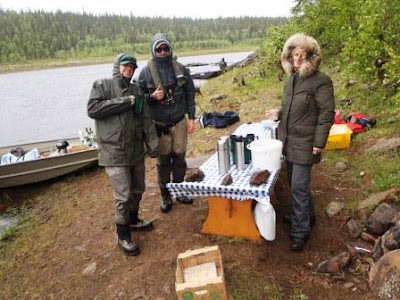 The banya was started up and by the evening the weather had cleared a bit, enough for us to have one of our casting evenings, testing and experimenting with all the rods down by the boats – while in the background Harry and Guillaume were trying for pike with my spinning rod. I do not have a score for you from Pana, the radio reception last night and this morning was poor, Toby sent through a text from his Sat phone – so I know that Beanie wants corn flower for next week, but he forgot to tell me how the fishing went! One assumes it was pretty good. Kitza had another solid day with 36 salmon landed and we matched that exactly here on the Middle beat with Ian again leading the board with eight and Michel L landing his first ever salmon. Not our best day in pure salmon fishing terms but a really relaxed and fun day with family and friends – what more could you wish for. Sunday was a perfect Kola day – blue sky with high, fluffy white clouds and a light wind. Just heaven. Yesterday was somewhat different – grey, closed in and really wet and windy. 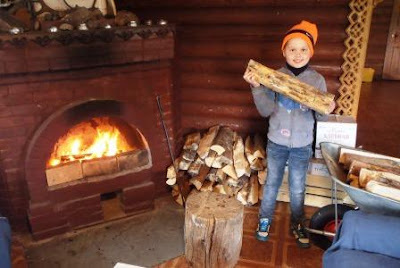 Terry organized the banya to warm people up on return and once rumour of its lighting reached our damp guests most made an early return to the warmth back at camp. The wind in the morning was such that Ian and Chris gave up trying to fish Party Pool – it was a real struggle even for Ian who knows what he is doing – so they moved upstream to the relative shelter of Clarkes and R’s Folly. I met them there after lunch and our plans of using surface flies were soon dashed. Firstly the river is still too high to fish right on the surface with any real confidence and secondly the weather was so foul that it seemed like a day for heavier flies and getting down to the fish. Chris ended up with eight salmon for the day – his best ever days salmon fishing. By 17:30 most of the team were back in and heading either for the Lodge fire or the banya. Overall it was a better days fishing than Sunday and we landed 33 salmon. But it was a bit spotty, some did well, others did not. This theme was repeated in both Pana and Kitza. Up at Pana they landed 46 fish, Charlie T had a bonanza with 17 of them; Nicholas B had a wonderful salmon of 17lbs from Tern Pool. 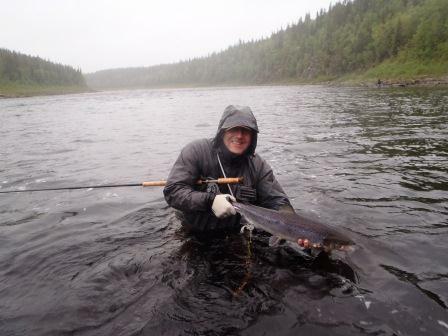 Kitza reported 36 salmon for the day, again the catches were not very evenly spread, Richard G had 12 of the total. This morning has dawned damp and cool. The air temperature is 7⁰C and there is an uninviting chill to the day. That said our spirits were lifted at breakfast as Ian S came in with the good news that he had landed two and lost two in Generator in an hour or so. The river is still steady, no real rise yet after yesterday’s rain and 11⁰C. With this water level and the ground really wet it is looking good for next week from a boating point of view – but I still cannot help wishing we had a tad less of it! Pana and Kitza are enjoying the extra water this year. 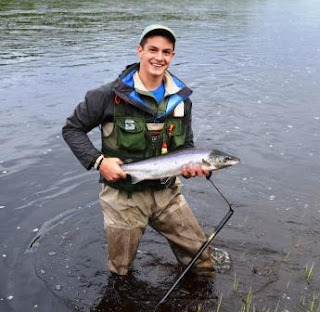 Ollie over at Kitza reported 28 salmon for the team yesterday with the additional great news that Mark L, who had not caught a salmon before, landed five on his first day of salmon fishing. The water level is perfect at Kitza, the entire river is accessible to our jet boats and with some rain forecast over the next 24 hours they should be fine this week. Up at Pana they had another excellent day with 48 salmon on the bank to add to the 21 they caught on the first evening. The water height means that they should be able to boat right down to Ponzoi all this week – hopefully for longer than that, but it will depend on just how much more rain we get. Here at Middle Camp I could do with less water! It is well over a foot higher than I might expect at this time of year – not a massive difference I know, but our upper beat at Yovas is so much better in low water. Ian S, who knows the river as well as anyone, went right up to Scots yesterday and with Chris M fished all the way down to Blue Rock. 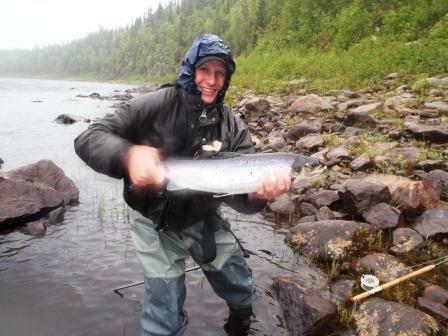 Ian had five salmon but felt that the water was just a bit too high to really make the most of it. 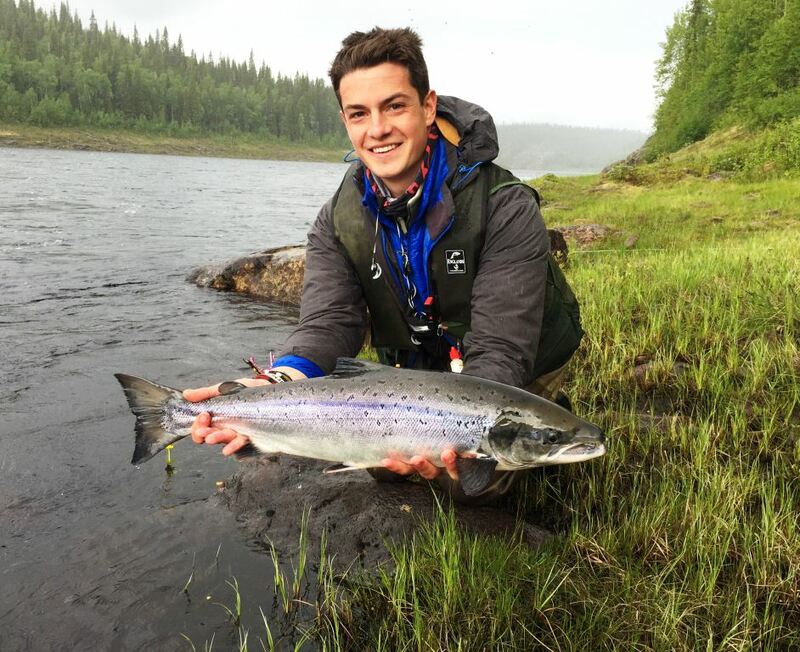 We landed 19 for the day, not a great score for the Middle Camp, but good to see Harry adding a further two to his fishing book having caught his first salmon the evening before. We have changed tactics a bit and today will try slightly larger, heavier flies – that said Ian and Chris are determined to try skating and have booked me for the afternoon session. I have the tail-out on the left hand side of R’s Folly in mind for them. Normally I’d put money on that place – but in this height I’m not quite as confident as usual. I’ll let you know how we get on. We will see what this new weather system brings us in terms of rain over the next 48 hours, after that it looks pretty settled. I know that those coming to Pana and Kitza next week will be happy with another good dump of rain. Here at Middle we have had enough thank you! I’ll keep you posted – now I’m off to dig out the box of Bombers and Sunrays to prep for the afternoon with Ian and Chris. I got back up here on Thursday morning, 11 June; almost to the hour a month ago on 11 May we were waiting for breaks in the ice to boat down to the Lower Camp. What a contrast! – it is difficult to imagine when you are back at home just how fast the seasons change in the far North. Murmansk airport was busy, very busy, yesterday. 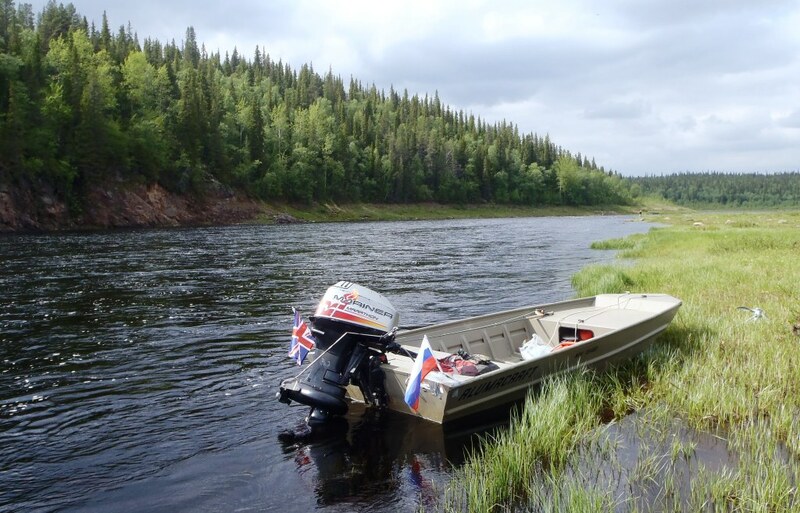 We are approaching the peak of the Kola season when all the rivers on the peninsula are up and running and the camps are fully booked. The airport bar was really noisy – lots of friends chatting away while in the background we made sure the 80 or so fishers got on to the right helicopter with the right baggage. Our 28 guests were all in the camps, Pana, Kitza and Middle, by 4.30 and here at Middle Chris and Ian beat the record and were in waders and kitted up within 15 minutes of landing. 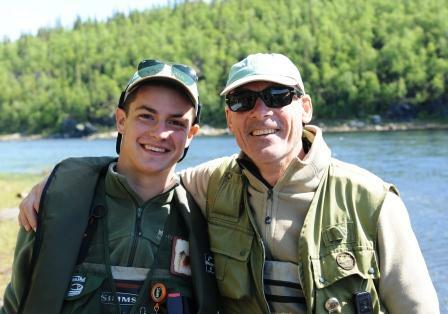 Harry P, who had not fished for salmon before, was not far behind them, indeed Tim, his dad, had not had time to put his waders on before Harry was off to try Generator Pool. It is a one of those wonderful moments in life when your son or daughter catches their first salmon. And all the better if you are there to witness it. Harry achieved his goal within an hour or so of touching down here. His smile said it all and Tim was a very chuffed, proud father – albeit it a bit damp, without waders on he had taken his shoes off, rolled his trousers up and helped Harry beach the fish. A great moment in life. Stefano M too had his first salmon pretty quickly and we settled down for dinner with a handful of fish already landed, two were ‘first salmon’ and there was lots of enthusiasm for the coming week. The water level has steadied off and will now continue dropping unless we get heavy rain. It remains quite a bit higher than this time last year, good news from a boating point of view but not quite ideal conditions yet for the Middle beat in June which, in my view, is at its best and most interesting when the river is lower. That said Kitza and Pana want higher water, the better to access all of the vast amount of fishing they have at their disposal. One wet but very happy Dad ! The water temperature is 13⁰C this morning and the weather seems settled – floating line conditions. However with the higher water most are sticking with intermediate tips for the moment, but there was talk at breakfast of trying Bombers and surface fishing. I guess everyone will give the standard fly patterns a mornings work before experimenting once they have a few fish under the belt. I have to post this blog down a painfully slow connection - so the photos are quite compressed, but I trust they will give you a feel for life and fishing up here. More news tomorrow.